The story of the temple of Tripura Sundari, popularly known as Matabari, in Tripura is a gripping tale of history combined with legend. King Dhanya Manikya was instructed in his dream by Mahamaya to bring her from Chittagong and install her on the hillock which is presently named Udaipur after her appearance there. Born in the family of priests of Tripura Sundari and a dance lover to boot, Boby Chakraborty’s long cherished desire was to hold a festival of dance in the precincts of the temple. She started from scratch begging temple authorities and government authorities to help in her doing so. Today it is a reality. 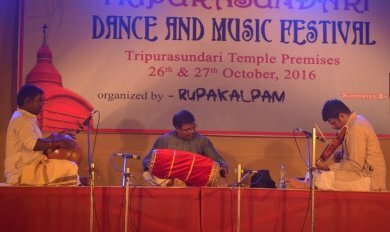 Tripura Sundari Dance and Music Festival 2016 (Oct 26 & 27, 2016) is in its third year. Ma Tripura Sundari here is Sodashi Kali, an epitome of strength and pulchritude, in whose praise Amar Ghosh sang a few memorable songs that go by the genre “Shyama Sangeet.” His song “Amay ektu jayga dao mayer mandire bosi” struck a chord in Ma’s heart and set the tone of the evening. Venkata Rao and disciple M. Kamesh set the stage on fire with their mridangam and ghatam playing. H. Ramcharan accompanied them on the violin. The mridangist had composed a varnam in honour of Tripura Sundari. Different and intricate rhythmic beats in the mridangam and ghatam with great expertise were pleasurable. 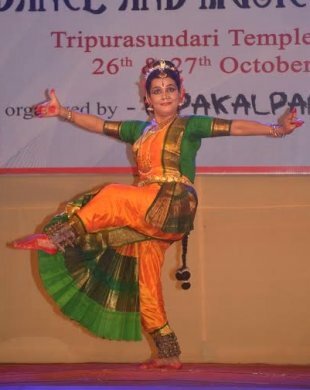 ‘Ardhanareeswaram’ presented in the Kuchipudi style of Guru Vempati Chinna Satyam was choreographed by Dr. Ardhanareeswaram Venkat, whose name has become synonymous with the piece. This kind of presentation was a new concept for the people of this North-Western region. Impersonating a man and a woman in the physique of one person in a sophisticated art form was appreciated by the audience. The superb dancing in both tandava and lasya style was excellent. The aharya abhinaya and the body structure of one side displayed masculine vigour, while the other epitomised grace. It needs mettle and talent to be able to do what Dr. Venkat does in Ardhanareeswaram. Odissi dancer Rina Jana is a dancer par excellence. She danced with grace and élan with her flexible lissome body. What she combined was aesthetically artistic. She was the embodiment of lyrical poetry, sculpturesque poses, paintings and all that can be termed beautiful. She formed different shapes of eternal beauty with her body movements and that is what classicism is all about. 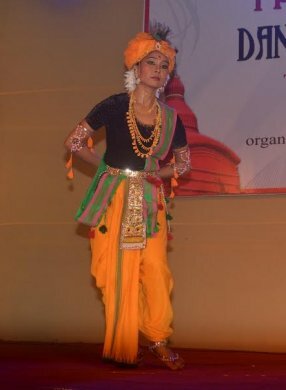 Manipuri dancer Swapna Singha performed Radha Nartan in solo, wearing the green poloi that is worn by Radha in Raas Lila. She is potentially a good dancer. Boby Chakraborty made a judicious selection of the performers, who are serious. She herself performed Shiva Stuti in the style of Vempati Chinna Satyam. She has taken Kuchipudi aesthetics to a region where people had not ever been exposed to it and has been teaching Kuchipudi in SDBM Govt. Music College, Agartala. Sattriya Dance of Assam seems to have become richer than what it was during its inception, thanks to the hard work that the gurus have been putting in. In this respect I may mention the name of Guru Jatin Goswami, who always has his thinking cap on, when he is adding or creating new dimensions and vibrancy to this art form. 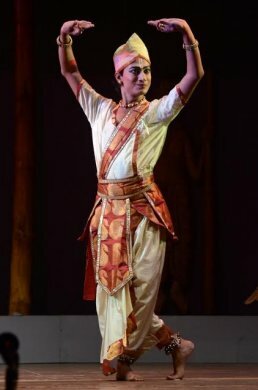 His disciple Bedanta Bikash Dutta is a young dancer of promise, who did well at the festival. 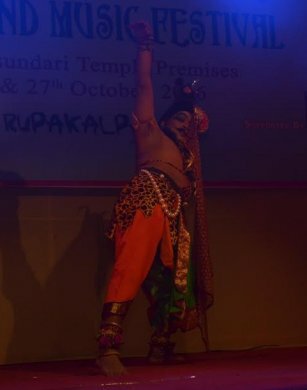 Besides his ability in pure dance, his devotional piece in praise of Yugavatar Sri Rama spoke volumes about his ability at expressional dance. The mood of the festival was joyful. People were getting ready for the Diwali Mela, where a record crowd of at least four lakhs were expected on the kurma shaped hill top housing Goddess Tripura Sundari, with the vast expanse of lake Kalyan Sagar on its eastern side. Tapati Chowdurie learnt dance for almost 10 years from Guru Gopinath in his dance institution Natana Niketan in Madras. 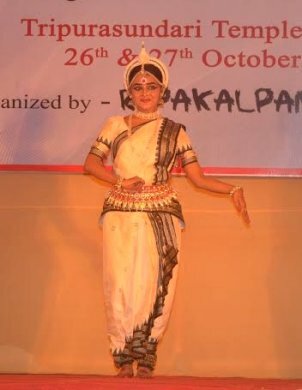 For a brief period, she was with International Centre for Kathakali in New Delhi. Tapati has a Master's degree in English Literature and Bachelor's degree in Education. She has a regular column in The Statesman, where she writes on dance and music. Presently, she is a freelance writer.